Radio was a powerful propaganda tool and strategic communications means toward the end of World War I, and certainly in the lead-up to and during the course of World War II. Many governments, including the United States and most European countries, forbade the broadcasting of signals by anything other than an entity licensed for commercial and/or military purposes. 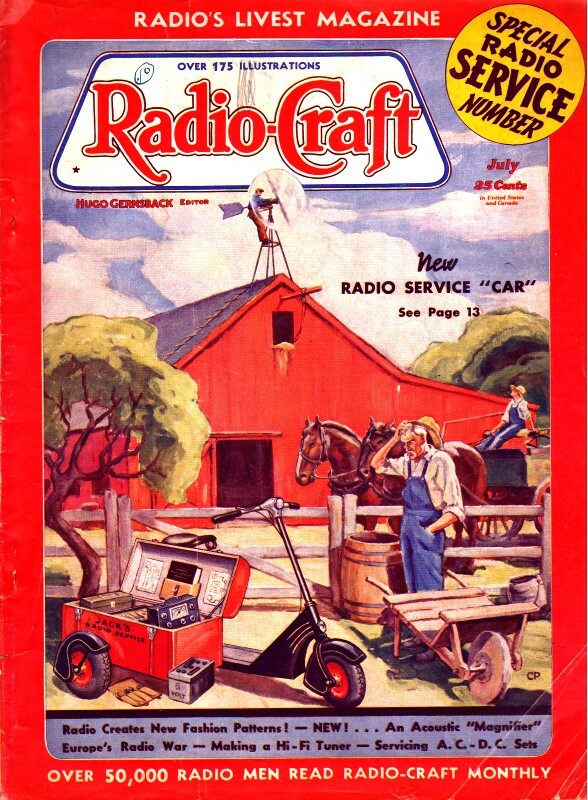 Amateur radio broadcasts were prohibited, although at least here in the U.S. possession of a receiver for listening was still allowed. Some of the regions controlled by Nazis did not even permit receivers - mainly because the government did not want citizens listening to anything that could be considered propaganda. Jamming of broadcast signals from 'Allied' countries was routinely practiced by Hitler's and Mussolini's tight-fisted controllers. Many citizens were imprisoned or executed for daring to harbor a contraband receiver. This story's author provides a first-hand account of the goings-on in the days just preceding WWII (officially begin September 1, 1939). 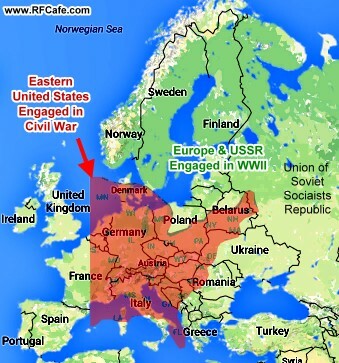 I created superimposed maps of the the primary U.S. Civil War states and the primary European WWII countries as a comparison of the sizes of areas being battled for by contiguous territories. An Englishman tells of the relentless radio propaganda war being fought on the Western Hemisphere. The use of "wireless" (radio) as a national weapon began during the Great War. In 1916, when the Germans could no longer use their submarine cables, they communicated with their military attaché in Washington by radio messages in code, sent by indirect routes. Unfortunately for them, this code soon fell into the hands of the British. Toward the end of the War, there was so much use of codes that, when the news of the Armistice was announced from the Eiffel Tower, not in code, several operators refused to believe what they heard, thinking the enemy was playing a trick! Over here in England, radio sets were forbidden during the War, and it was rumored that listeners had secret antennas fixed in disused chimneys. This may have been true; but I know that a similar thing occurred in Germany just after the War. In the occupied area, the Allies forbade the use of broadcasting and its reception within the area. Some German friends living in Cologne told me that they had an indoor antenna and so did many of their friends. The antenna was taken down when the set was not in use. The first radio propaganda on a big scale was put out by Moscow. The Russians now broadcast propaganda in about 15 different languages, and they have the most powerful transmitter in Europe. It has the same power as WLW, Cincinnati. Soon, however, the British Broadcasting Corporation is to build two powerful shortwave transmitters which will be the most powerful in the world. The Russians are fortunate in that their time is 2 hours ahead of Central European Time, so that after their own programs, they can use nearly all their stations for broadcasting to the rest of Europe. The Germans have made great efforts to jam the Russian transmissions. Some German friends of mine had a town house which they were compelled to lease to the secret police. The owners discovered by accident that the police had installed a Störsender, or "interrupting station." It was intended for the interruption of the transmissions of the Russian station of Minsk, a town less than 50 miles from Russia's western frontier. The moment that the propaganda in German starts from the Moscow station, interference begins. On the long waves it takes the form of Morse (code) or a kind of dynamo hum. On the shortwave transmission, the German interference is usually made by the continual playing of a phonograph record. The record is usually one of the waltz Ramona, but the Germans do use one other record, and this is of a slow fox-trot. I know several Germans who listen to the Russian transmissions. This means that the jamming is not always successful. This is especially noticeable on the short waves, where the skip distance effect may mean that you can hear the transmission but not the interruption. On the medium waves, things are different. Only a few weeks ago, a German told me that he tried to hear the speeches of Herr von Schuschnigg, the former Austrian Chancellor, but that he was unable to because they were jammed by the German authorities. The most exciting event on the short waves took place last spring when a mystery German station suddenly appeared on a wavelength of 29.8 meters, Some say that it must be outside Germany, but nothing has ever been proved about this station. From 10 till 11 every night, it gives anti-Nazi propaganda, talking, for example, of the "gruesome barbarities of the Hitler regime." A German told me that the first night after this station was first heard in Berlin, half the population of the town knew about it. The station was said by the announcer to be in Berlin, but it could not be traced. It was thought that the transmitter was placed inside a car, and the vehicle driven round the town; but when I listened here in England, the signal strength seemed too constant for that to be the case. After a time, the German authorities caused such severe jamming that it became very difficult, almost impossible, to hear this station. But it still broadcasts, and is now to be heard on a wavelength of 23.8 meters. It remains a real mystery. The Spanish trouble has added greatly to the war on the air. First of all, Moscow transmitted more Spanish talks than formerly, saying to, the Republicans, "We are with you with all our soul." 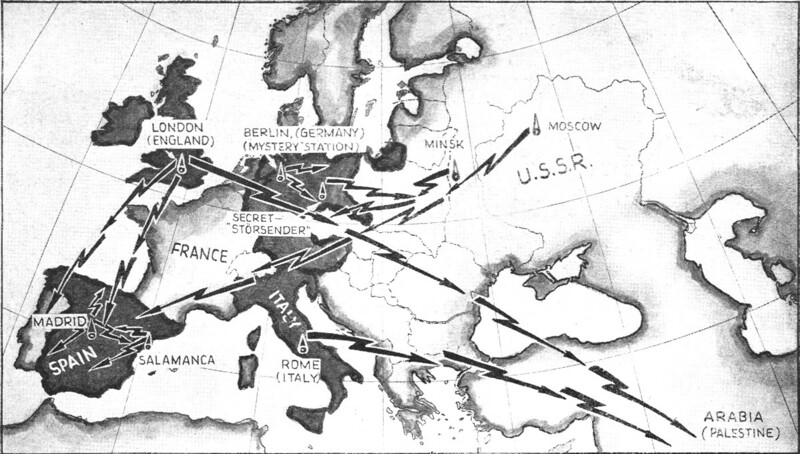 Then General Franco captured several broadcasting stations sharing wavelengths with those still in government hands. Bilbao and San Sebastian used to vie with one another, until the capture of Bilbao when from the broadcasting station could be heard the entry of the troops. Then General Franco increased the power of the Salamanca station to unknown kilowatts and transmitted on the same wavelength as Madrid. Another feature of the struggle has been the entirely illegal use of the amateur wavelengths on the 40-meter band for news and propaganda. And within the last few months, one or two stations have begun transmitting on the 20-meter band. Both sides do this. They give propaganda in at least 4 languages, and both try to jam each other. In addition, it is noticeable that the Spanish government transmissions in German and Italian suffer more from jamming than any others. Presumably, the German and Italian authorities are responsible for this. A strange happening in the Spanish war has been the transmissions of a station calling itself "Radio Verdad," and broadcasting in Spanish. (Verdad is Spanish for truth.) As they use several Italian wavelengths on the medium band, I thought that either the Italians were closing down their stations to allow the Spanish station to broadcast its "truth" propaganda, or that the Italians were responsible for the whole thing. They give an address in Salamanca to which listeners are asked to write. I wrote, but have had no answer. When listening to Rome at 7 o'clock G.M.T., I heard the station sign off, and then the carrier disappear, before Radio Verdad made its transmission. But Radio Verdad's announcer has a slight Catalan accent, which shows that he does not come from Salamanca. This made me suspicious. Then a friend used directional antennas on the transmission, and Radio Verdad was proved to be the Italians masquerading as Spaniards. This is perhaps not very surprising, since I have seen it stated that broadcasting in General Franco's territory is almost entirely under Italian control. Oddly enough, the only Italian I know had a job with the Italian broadcasting company in Rome, and then he went to Salamanca, General Franco's headquarters. Italian used to be the only major European language in which the Russians never gave Communist propaganda. I wrote to Moscow and asked them why; but, though they answered my letter, they refused to answer this question. It has been suggested that a clause between the two countries forbade the broadcasting of propaganda. In addition, there was a rumor that Mussolini had so successfully jammed all the Russian stations that they ceased their propaganda in Italian. However, lately, Moscow has been giving propaganda in Italian - just another radio mystery. The Italian broadcasts from Rome and Bari in Arabic have raised much protest over here in England. But in addition to those in Arabic, there are others in Chinese and other Oriental languages. It is these Arabic transmissions that have compelled the British Broadcasting Corporation to broadcast in Arabic in order that Palestine should have a source of radio news other than that from Italy.